Iodine and chlorine dioxide in multiple form factors. If you’re somebody who’s looking to graduate from car camping to a backcountry experience, chances are you already have some of the basic gear you’ll need to do this: a tent, a sleeping bag, reasonably appropriate clothing, a backpack, etc. While there are a host of other skills you’ll need for backcountry hiking/camping (reading a map, campsite selection, understanding the weather, knowing your physical limitations, etc.) the question people will most often think of first is: Where will I go to the bathroom? Once they’ve wrestled with the idea of going #2 in a hole and they’ve accepted this reality, the next question they’re presented with is: Where and how will I get clean drinking water? Let’s set aside the “where” part of that question for now (we’ll assume the map shows some sort of reliable water source like a river, lake, or stream) and focus on the “how”. Traditionally, water purification has been broken down into 3 categories: filters, chemicals, and boiling. I’ve never really understood why people continue to list “boiling” as a viable solution for purifying water; it’s only slightly more efficient than hiking 10 miles to your car, driving 20 to the nearest gas station for bottled water, then driving back. Yes, technically you can boil water and it will be safe to drink. It can certainly be done in worst-case scenarios. But realistically it just isn’t a sustainable solution for a hiking trip. Besides the amount of time you would waste waiting for your water to boil and cool again, the amount of fuel you would have to carry to sustain this practice would be inconvenient to say the least. In my mind there are 2 practical exceptions to this: cooking and melting snow for drinking water. So, with that out of the way, let’s take a look at the first 2 and add a new 3rd (UV treatment). Historically, filtration meant some sort of hand pump. Check out the MSR Sweetwater filter as an example. Generally speaking, the main advantage of filtration over other methods of purification is that you can draw water from a cloudy/dirty water source and it will come out safe AND clean (you can treat cloudy water with chemicals and it will be “safe” to drink, but it will still have crap floating around in it and it might taste bad). Another advantage to “traditional” filters is that you can easily draw water from a very shallow source since the pumping mechanism collects the water while treating it (meaning that you don’t have to scoop the water into a dedicated container first). The disadvantages to “traditional” filters are that they’re heavy (usually around a pound or more), bulky, complex (more moving parts = more things that can break), and slow for small quantities of water (due to the time that it takes to get it out and hook everything up). Filtration has seen a much-needed overhaul in recent years with lighter and more streamlined versions coming to the market; the Sawyer Squeeze and Sawyer Mini being prime examples. 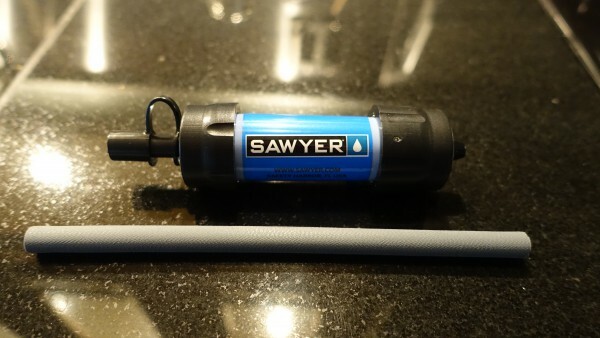 The Sawyer filters in particular have become a staple among lightweight backpackers. They address several of the drawbacks to the older, pump-style filters like weight, bulk, moving parts, and setup time. They lack the ability to draw water from a shallow source into a container, but some include a tube that allows you dip them into a puddle and drink directly through the filter (if you’re that hard up for water). Cost is also an improvement, with the Sawyer filters usually being at least half the cost of a pump. Like anything, there are downsides to the Sawyer filters. While their setup time is a fraction of a traditional filter, the time it takes to actually filter a liter of water is somewhat slower. The “dirty” bags that Sawyer provides are notoriously unreliable. Also, while having a separate “dirty” bag isn’t necessarily heavy, it’s usually not considered along with the filter as part of the overall weight of the system. You can leave the dirty bag behind and drink everything straight through the filter, but that grows old fast due to the slow flow. There are alternatives to the Sawyer offerings, like bottles that have built-in filters and devices like the LifeStraw that you can use either with a water bottle or directly in a water source. One area where traditional filters still excel over the newer, more streamlined, versions is in a group setting. The Sawyer filters work well for 1-2 people but the quicker setup time is soon offset by the slower flow. There is an option that lies somewhere between the two: a gravity-style filter. The cost is closer to a pump (maybe even slightly higher, depending on the model) but the design is similar to the Sawyer filters. The advantage is that the filtration process is somewhat automated once the water is collected, which frees up valuable time for multitasking. One last thing to keep in mind for all filter types is that they can freeze in the winter since some water will remain inside of them (which also adds weight regardless the time of year), but since the smaller filters are pocketable, it’s easier to keep them warm. Iodine, chlorine dioxide, and household bleach are typically the most common chemicals used for water treatment. There are references to other, less common, methods elsewhere on the Internet (survivalist forums, for example) but for the purpose of this article I’ll stick with these three. Iodine was the go-to choice for many years, and while it’s still used and widely available in tablet form, it’s gradually being supplanted by chlorine dioxide. The main selling point that’s touted when comparing chlorine dioxide to iodine is that the former kills Cryptosporidium whereas the latter does not. The advantages to chemical treatments are that they’re almost universally the lightest and most compact methods available, and are often considered to be the most thorough (and therefore the most reliable). They’re usually easy to use, especially in tablet form (just drop in a bottle of water and wait). AquaMira (chlorine dioxide in liquid form) requires a prerequisite step, which is to mix drops together from 2 separate bottles to create a solution which then becomes the treatment that’s added to the water. While this adds an extra step to the process, liquid treatments tend to have a significant advantage over tablets: the amount of water you can treat in relation to how much of the treatment you have to carry. For this reason, I don’t consider tablets to be efficient as a primary means of water treatment. Even if you’re only out for the weekend and can easily carry enough tablets to cover the trip, the cost for that option ends up being quite a bit higher. 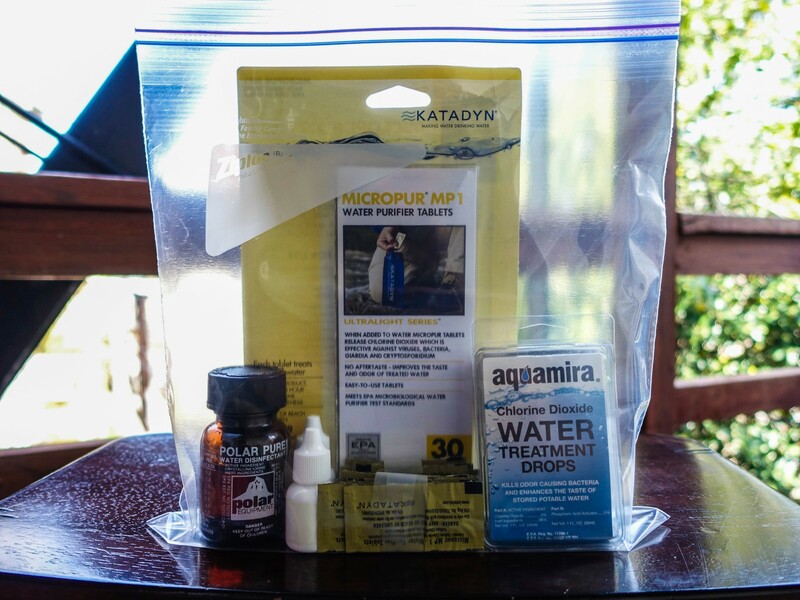 At the time of writing, a pack of 30 Katadyn Micropur tablets (chlorine dioxide) costs $12.95 at REI, which basically treats 30 liters of water. AquaMira (two 1oz bottles that are used together) is only $2 more and can treat up to 30 gallons of water, or 120 liters, which is 4 times as much as the pack of tablets. 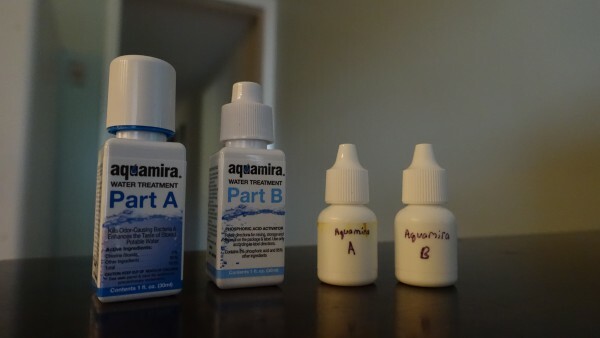 Tablets can still be useful as a backup option, although for longer trips I prefer to repackage AquaMira into 10ml dropper bottles. If my primary method fails early on, the liquid solution will get me much further than if I had tablets. If I had tablets as a backup I would probably only have enough for a day or 2… basically just enough to get me out of the backcountry safely. AquaMira in its standard 1oz bottles and repackaged into smaller “dropper” bottles. There are several drawbacks to using chemicals. You typically have a more finite number of treatments when compared to other methods, which may or may not be an issue depending on the length of the trip. Taste is obviously a consideration and there are even multiple products on the market today that exist for the sole purpose of neutralizing the flavor imparted by chemicals. The fact that you’re even consuming chemicals in the first place is an issue for some, and while I can’t say one way or the other whether any have long term health risks, I think most people accept the idea that consuming fewer chemicals whenever possible is probably safer. One practical limitation when using chemicals to treat your water is that while they can “purify” cloudy water, they obviously can’t “clean it” in the sense of removing sediment, dirt, and other nasty floaties. The time it takes for chemicals to work is another issue, which usually involves at least a 20-30 minute wait until you can safely drink your water. That’s assuming you’re not treating for Cryptosporidium, which, for chlorine dioxide, requires a 4 hour wait time. And that leads to a major point regarding chemical treatments: there is a lot of misinformation out there. For example, some people consider bleach to be a superior alternative to iodine and chlorine dioxide due to cost, availability (who doesn’t have a bottle of Clorox under their sink? ), and the small amount needed to treat water (usually only a drop or 2). The first problem with this assertion is that it’s vague because there are different types of bleach on the market. Most people know enough to assume a chlorine-based solution, but even then a lot of people don’t realize that standard bleach has a relatively short shelf life (digging the old bottle out from under the sink right before a trip is probably not a good idea). But how short, exactly? It depends on who you ask. This post quotes a Clorox representative who says that bleach can be stored for 6 months, at which time it begins to degrade at a rate of about 20% per year. But if you look at the Shelf Life FAQ on Clorox’s own website, it simply says that their product is good for a year with no mention of degradation after 6 months. It’s likely true that degradation at 9 months is still within the range of being useable, but when you take into consideration some of the variables stated here, results can vary based on temperature, time of year, and (not mentioned in the article) how long it sat on the store shelf before you bought it. Similarly, iodine tablets are said to have a shelf life of 1 year once the bottle has been opened. AquaMira has an expiration date printed on each bottle of about 4 years, which is said to be unaffected by opening it, but I’ve yet to see this printed on their website. There is an interesting post on the Backpacking Light forum that includes a response from AquaMira’s COO regarding some specifics on their product. 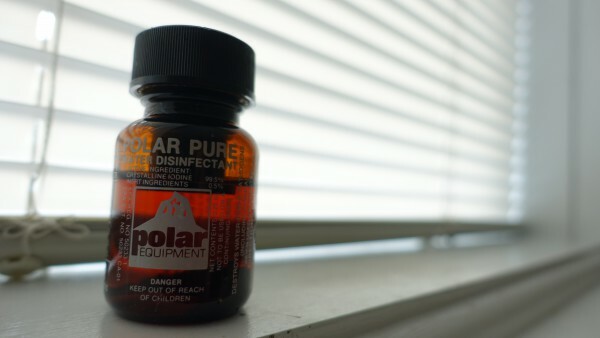 Polar Pure was a fantastic form factor for iodine before it was pulled off the market due to restrictions in California that were meant to stem the production of methamphetamine. As of last year it’s back on the market through Amazon.com. I still have my original bottle from the late 90’s (shown here), but have since moved on to other treatment methods. On the topic of Cryptosporidium, a lot of people who buy chlorine dioxide do so because of the selling point that it is effective in this area where iodine is not, but then they drink their “treated” water after only 20-30 minutes (the instructions say it takes 4 hours to kill Cryptosporidium). Further, some people assume that bleach is a comparable substitute for chlorine dioxide because it contains “chlorine”, but it’s really not the same thing and household bleach is actually said to be ineffective against Cryptosporidium. One last thing I’d like to point out is that chemicals are often considered to be the most thorough option because they’re the most effective at “killing” threats, but this assumes that all threats are biological. While it’s not common in the backcountry, it is possible for water sources to become contaminated with things like heavy metals or even other chemicals… neither of which can be addressed by iodine, chlorine dioxide, or bleach. Chemicals can be an extremely effective solution for treating water in the backcountry but they can also be surprisingly ineffective if proper care and understanding are not taken. Pocketable devices that emit UV light to treat water are definitely the newest solution of the three, but the technology in general has been around for a while. To my knowledge, SteriPen is pretty much the only player in this market right now and they have a multitude of devices available, which can be a bit confusing at first. Currently, the main differences between each model are size, shape, and battery type (AA, CR123, USB rechargeable), as well as price. The advantages of a SteriPen are immediately apparent as are its drawbacks. It’s easy to use, fast for small quantities of water (perfect for 1-2 people on the go), fairly lightweight (heavier than chemicals and smaller filters like the Sawyer Mini; easily lighter than pumps), and very compact/streamlined. Like filters, another advantage is that you’re not drinking chemicals. The SteriPen Ultra requires a USB power source to charge but that may not matter since a single charge can easily get 1 person through a week in the backcountry. The reliance on electricity/batteries makes it a more delicate and complex device, so care must be taken not only to keep it safe but to ensure there’s sufficient power as well. While these points generally fall into the “disadvantages” category, I don’t necessarily hold them against the SteriPen since it’s just the nature of how the product works. 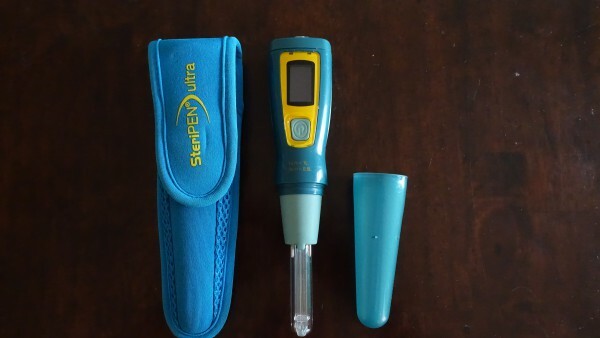 The functional disadvantages of a SteriPen are that, like chemicals, they don’t do anything to “clean” the floating stuff out of the water, and if you’re trying to use it for more than 1-2 people it becomes a bit slow compared to the previous options. Also, on the topic of “dirty” water, the SteriPen actually has a greater disadvantage over chemicals because while chemicals can still make cloudy water safe to drink, turbidity can actually interfere with the SteriPen’s sterilization process. Despite these disadvantages, the SteriPen Ultra has been my primary water treatment option for about 2 years now and I don’t see myself changing up any time soon. I can walk up to a water source and have a liter of drinkable water in under 2 minutes, so it’s easy to hydrate at the water source and then fill up again for the trail. Further, because it’s the quickest option for having a liter of water to drink at the water source, it sometimes allows me to carry less water between sources. Power is a non-issue for me because the Ultra is rechargeable via USB, and since my phone and camera work the same way, I carry a battery pack to supplement the charges for all 3 devices. As far as it being delicate, I’ve never had any major issues with it other than the time my friend dropped it into the river. It ended up being salvageable after the trip (I never turned it on again and was able to get it mostly dried out, with the exception of a small amount of moisture on the inner lamp which the company was able to fix). Since I’ve always been cautious about not dropping it into the river by stepping back onto land before using it, the only real lesson here is: don’t let my friend Sam near your SteriPen. The main concern I had when I first saw the SteriPen years ago was the lack of independent testing in a controlled environment or available documentation for that testing, but that’s been addressed by the documentation SteriPen provides as well as this video. It should be noted that most of the success stories for treating water in the backcountry should largely be considered anecdotal, because the “I used it and I didn’t get sick” argument doesn’t prove that there was ever contaminated water in the first place. There have been several articles in recent years that have suggested that waterborne pathogens are less common in the backcountry than previously thought, and that personal sanitation (or lack thereof) is probably a larger contributor to intestinal issues than dirty water. Choosing a treatment method should not be done based solely on the say-so of somebody who tried it a couple of times and didn’t get sick; be sure there is ample scientific evidence that the option you’re considering is actually effective at killing waterborne pathogens.